ATLANTA, Georgia (CNN) -- The former acting director of the Centers for Disease Control and Prevention plans to leave the agency to become the senior health and medical editor for ABC News. Dr. Richard Besser speaks at a briefing on the swine flu outbreak on April 26, when he was CDC's acting director. 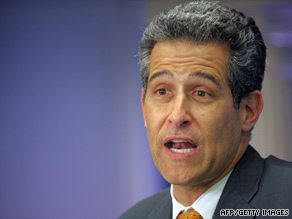 Dr. Richard Besser was the CDC's acting director when the swine flu outbreak mushroomed this year. More recently he resumed his role as director of a CDC office that focuses on terrorism preparedness and emergency response. "Working here has been my dream job," Besser said Thursday in an e-mail to agency staffers. "In my role at ABC, I hope to be able to tell stories that shine light on the important health issues of our times." The president of ABC News, David Westin, announced the network's hire in a written statement on Thursday. "Dr. Besser's distinguished background in public health, emergency preparedness and epidemiology will enhance the leadership of ABC News in reporting and explaining medical issues to our audiences," he said in the statement. Dr. Timothy Johnson of ABC News will become the network's chief medical editor, the statement said. It quoted Johnson as saying that Besser "proved his mettle" as "the public face of the CDC's response to theH1N1 outbreak" this year. Besser's last day at the CDC will be August 15, he said in his e-mail. He was the CDC's acting director from January to June, when Dr. Thomas R. Frieden took the helm. Frieden had previously been New York City's health commissioner.